Tag line: "Are you ready for your heart to be broken? He's going to do it"
As much as I love 1981’s My Bloody Valentine (my all-time favorite ‘80s slasher), I have to say the 2009 remake is every bit as good. Originally presented in 3-D, My Bloody Valentine is a nice combination of old and new, borrowing elements from the original movie while, at the same time, updating the story for a modern audience. Eleven years ago, a mining accident, the result of a mistake made by Tom Hanniger (Jensen Eckles), the owner’s son, led to six miners being trapped underground for several days. When rescuers finally reached them, only one was alive, and he was in a coma. Upon further research, it was discovered that the lone survivor, Harry Warden (Richard John Waters), had murdered the others by striking them in the back of the head with his pick-axe, all in an effort to conserve oxygen. The following year, on the 1st anniversary of this tragedy, Harry Warden woke up from his coma and went on a killing spree, butchering hospital employees before heading home to take out a few of his former co-workers. If it hadn’t been for Sheriff Burke (Tom Atkins), Tom Hanniger himself would have been one of Harry’s victims. Shot several times, Harry Warden stumbled into one of the mines and disappeared. When he never resurfaced, he was presumed dead. Jump ahead ten years. After being away for the last decade, Tom Hanniger is back in town, preparing to sell his interest in the mine following the death of his father. Some of the town’s elders, including Sheriff Burke and Ben Foley (Kevin Tighe), are none too happy he’s selling, and to further complicate matters, the love of Tom’s life, Sarah (Jaime King), has since married his former best friend, Axel (Kerr Smith), the new sheriff, leading to a rather tense reunion. And if this isn’t bad enough, it appears Harry Warden is back, slaughtering unsuspecting townsfolk with his trusty pick-axe. But is it really Harry Warden, or is someone else responsible for these killings? 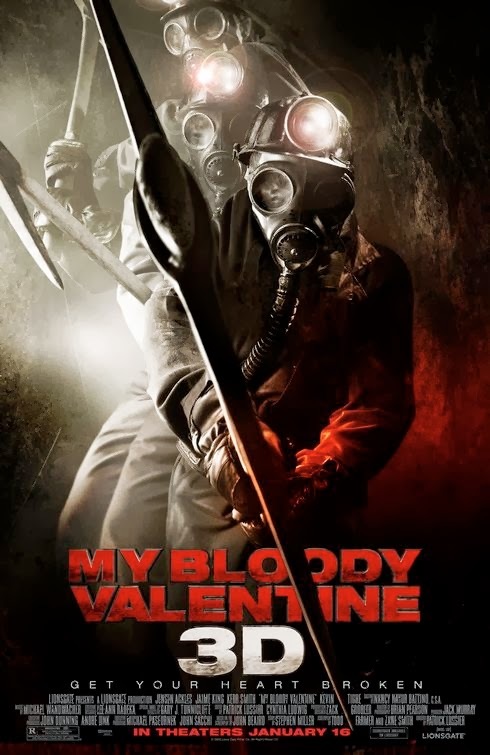 Thematic elements aside (two former friends in love with the same woman), the main thing 2009’s My Bloody Valentine has in common with the original is its high level of gore. Like the ’81 version, the remake features some very messy kills (old Harry likes to bury his pick axe into other people’s skulls, which he does several times throughout the movie). But this is where the similarities end. For one, the Valentine’s Day dance, a key plot point in the ’81 film, is nowhere to be found in this movie. Also, the characters themselves are much more complex; the love triangle involving Tom, Axel, and Sarah is further complicated by the fact Axel is carrying on an affair with Megan (Megan Boone), who works with Sarah in the local grocery store. Even the small-town vibe is different in this film, with the entire community up-in-arms because Tom is about to sell the mine, which could result in massive layoffs. Ultimately, these changes make the most recent My Bloody Valentine a darker movie than the original, while also providing a view of small-town America that, in the end, is less than flattering. For sentimental reasons, I still prefer 1981’s My Bloody Valentine to this version, and odds are I always will. But as remakes go, 2009’s My Bloody Valentine ranks right up there with 2013’s Evil Dead as one of the best I’ve ever seen. I prefer this to the original, but that could be because the only version of the original I've seen is so heavily edited it's neutered.